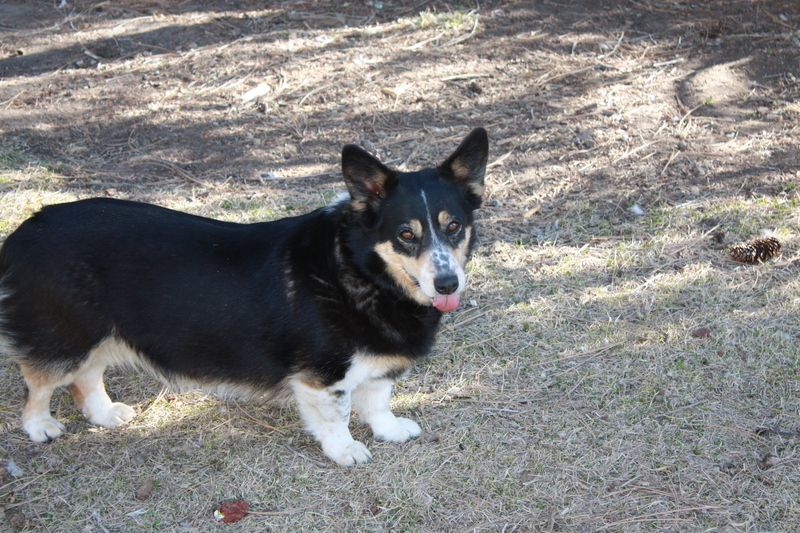 Sally Mae is a Welsh corgi-mix who lives half a mile up the road. She is a frequent visitor and playmate with our dog Rosie, and has become an important member of our animal kingdom. She frequently joins us for our daily walks and loves taking a dip in the pond along the way. She also hangs around for a dog cookie after the walk, and if she is out and about, she pays an evening visit for a little supper with Rosie and Lady. Dogs are territorial, and occasionally Rosie has fits of jealousy if we pay too much attention to Sally, who is hard to resist. She has an infectious grin, and slyly wriggles into our presence looking for a hug, a few pats or a rub. If she is outside when we head into town, she will streak up the road as fast as her very short legs will carry her to try to beat us to the cattle guard, and she often does. She then turns around with a triumphant toss of her head, grinning with her tongue hanging out, victorious that she won the race.
. . . let's get this walk underway already! She and Rosie both enjoy tracking whatever is out in the sagebrush on our walks, but Sally does it with a ferocity that is surprising in so gentle a little dog. Whenever a rabbit emerges, she is on it! And while she never catches them, she gives it everything she has, tearing through the grass and sage, leaping over any obstacle to catch her prey. She also used to like to heel and nip at the horses in the corrals around her place. We have yelled and hollered at her repeatedly to stop this endeavor for fear she will be stomped or kicked by the horses, who do not enjoy this aggravation. One afternoon shortly after she joined me for a walk, she broke away to bark and nip at one of the horses just through the fence. On this day a big bay gelding let fly with a hind leg and struck her in the head with its hoof. She was able to escape back under the fence and onto the road, where I reached for her with my heart pounding with fear. I gathered her up and raced for home. Sally was bleeding profusely from her nose and I could not tell whether she had bitten her tongue or what the damage was. I wrapped her in a horse blanket and layed her in the old Dodge Rambo. I will never forget the pleading look in her eyes as she struggled to breathe with blood filling her nostrils. Just our luck, the vet was out of town and not expected back for a few days. Sally’s owner was also out of town. I kept calling until I located a family member who said they would come and attend to her. As we waited, I examined her more closely and could find no damage other than to her nose, which was swelling but showed no external damage. Her tongue and teeth were intact. Sally recovered and although she snuffled a lot for a few weeks while the cartilage in her nose heeled and she was able to clear her nasal passages, she seemed almost as good as new. And she no longer displayed any interest in horses whatsoever. She does continue to have one overriding interest, however, that keeps her pretty close to home: Her ongoing love for her master who died a couple of years ago. I know Sally still expects he will return one day, and we’re told she sleeps under his desk in the house at night. I was reminded of this by a movie we watched recently about a dog in Japan whose master died unexpectedly. Based on a true story, the dog’s name was Hachiko, and he was an Asian Akita who returned to the train station to await his master’s return for nearly a decade. The Japanese people were so moved by his single-minded devotion they erected a bronze statue in his honor. This story of unconditional love and the unbroken bond between a dog and his master even after death left me so moved I was still weeping the next day. I will think of this story always, and I will try to hug Rosie and Lady and Sally a bit harder whenever I get a chance. This entry was posted in Wildlife blog and tagged animals by bygeorge. Bookmark the permalink.